Which One Of These Common Food Crops Is Deadly If Stored Incorrectly? In 1981 It Would Take You Two Hours To Download What? At some point in your life, there’s a good chance that somebody (quite possibly a sage old grandmother) warned you against eating old or green-looking potatoes. While there are plenty of old wives’ tales to go around when it comes to food safety and such, the warning against consuming old potatoes is a warning well-heeded since potatoes are a food crop that shares a family tree with the very poisonous nightshade plant. Tomatoes, eggplants, and potatoes are the three most common food crops found in the genus Solanum, part of the Solanaceae family. Along with the food crops in the genus, you’ll also find a variety of ornamental plants and the species Solanum dulcamara or woody nightshade. While fresh and properly cooked potatoes pose no threat to humans, there’s the specter of nightshade waiting in the wings. People have very little trouble avoiding eating actual nightshade (since it’s not particularly common and most of us don’t go around eating wild plants we find on the side of the road) and, as a result, potatoes are the single biggest source of nightshade, or solanine, poisoning in humans. Old potatoes stored improperly (exposed to light, stored too warmly, or for too long) will begin building up dangerous levels of solanine. Consuming said potatoes (despite their green appearance and increased bitterness) can cause extreme gastrointestinal distress, paralysis, convulsions, coma, and even death. 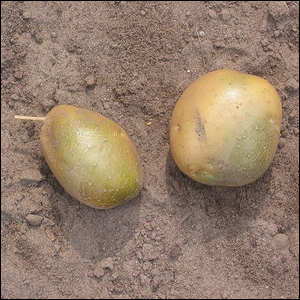 Thankfully today, potato crops are monitored for solanine content (and batches with abnormally high content are discarded) and preparation methods that remove the skin discard significant amounts of solanine. None the less, given how cheap potatoes are, if your potatoes have sprouted in the pantry, taken on a green tinge, or both, then it’s wise to throw them out and avoid any risk of solanine poisoning.